The premium Magento themes are just what you need to build your very own powerful and eye catching ecommerce website. Using premium Magento themes gives you total control over your website. You get premium features like customizable background colors and fonts, drop down menus to ensure easy navigation and not to mention a detailed and complete option of sorting your products into lists. Links are provided to each product which shows prices, discounts and a general over view of the product. These top features help in making Magento themes a favorite among online web store owners. 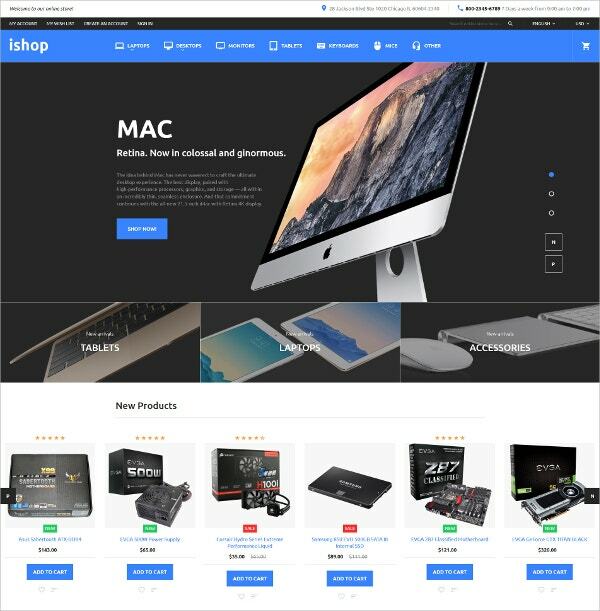 These themes are available to suit all sorts of requirements of web stores; ranging from selling bikes to books, everything is possible with these Magento themes. There are comment sections available for viewers and buyers to leave feedback so that others can get helpful insight about certain products. 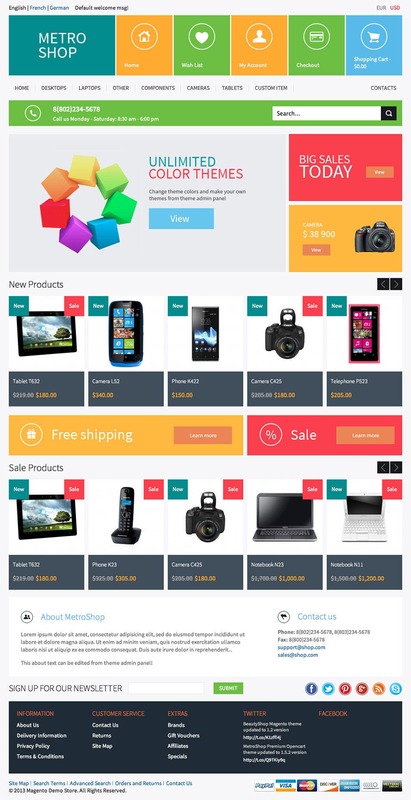 This is a Magento theme that is fully responsive and comes with a number of features. Moreover, the theme could be customized in a number of ways, in accordance to the need of the customer. The idea is to make shopping fun and easy. 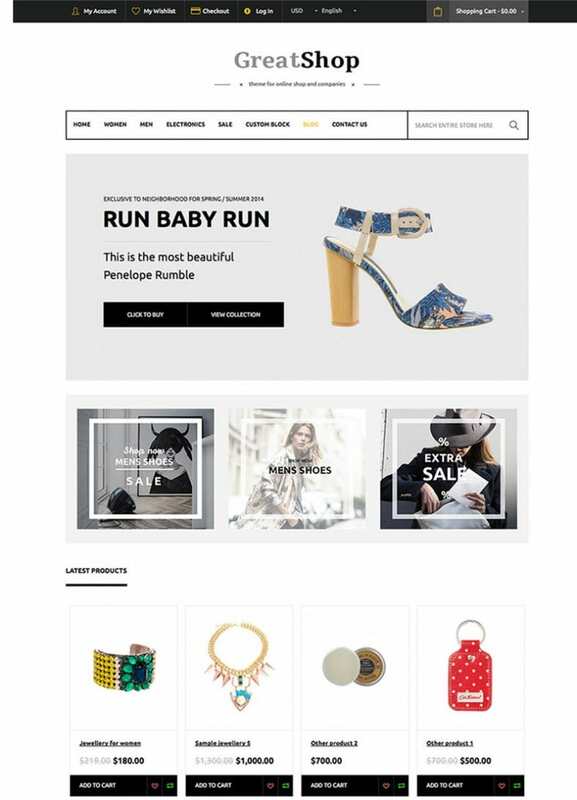 This website theme is perfect for eCommerce sites especially fashion shopping site and comes with extensions such as Megamenu, social icons, and cloud zoom from Magento. The theme is highly responsive and flexible, and provides a smooth experience to the user. 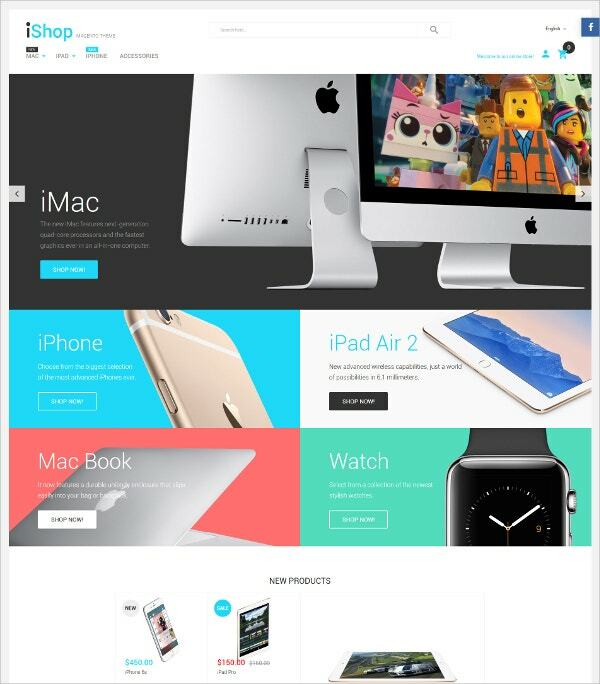 This is a responsive Magento theme which comes with Retina ready feature. The other features of this theme includes banners of various categories, 6 lay outs for the homepage, unlimited color selection option and social bookmarking for products which make this theme useful. The electronic Magento theme comes with responsive design that will ensure that your site adapts itself with any gadgets quite easily. The text and images of the theme comes with an amount of flexibility. It also has a few stock photos for its customers. This theme is highly adaptable to any kind of gadget and the texts and images do not distort, as they are flexible enough. The theme provides you with a number of high resolution stock photos for free which you can use as long as you want. This theme is most suitable for a site which is related to animals. The theme is responsive and flexible, and therefore adapts to any screen size, making the experience of the viewers smooth. The theme also comes with features like Megamenu. The design of the theme is clean and beautiful, and it is easy to install too. It is also responsive, which makes the website more user-friendly. 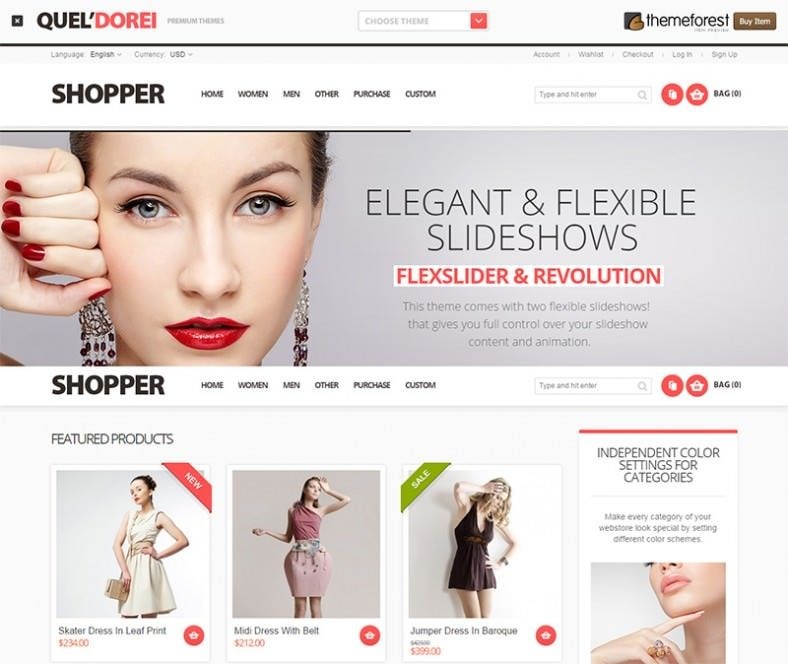 The additional features of the theme include back to top button, drop down cart etc. These themes feature a quality interface which helps in maintaining the traffic and provides hassle free navigation. You can keep viewers updated with discounts and bargain deals by using tables for easy access to various deals. These themes are the best option for online customers who want and easy online shopping site. These themes are free and they can be easily downloaded from the various website online. So give your ecommerce website a major boost with these premium Magento themes today. This theme is flexible and powerful and the design is Retina ready in nature. 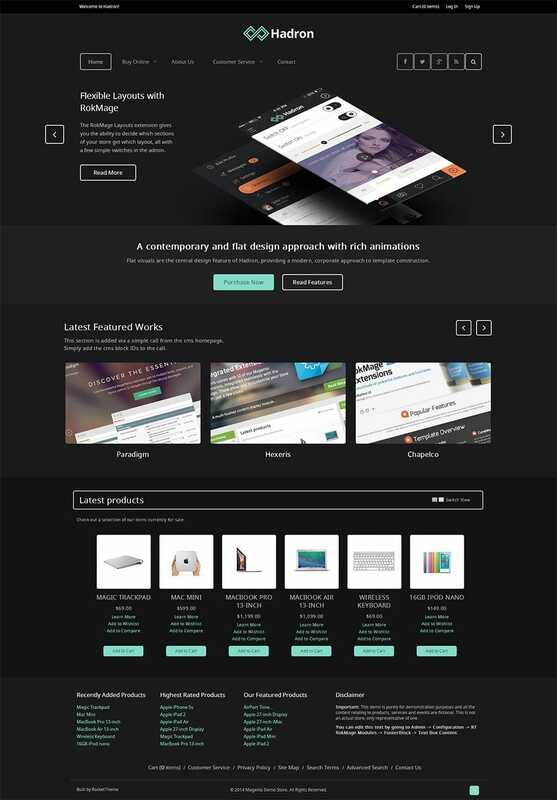 There are a number of great features associated with this theme, such as custom grid mode and Ajax price slider among other things. This is suitable for any e shopping sites. This is a superior quality responsive theme which is a combination of modernized flat design and a flexible functionality of the backend. There are a number of amazing features such as Google rich snippets, revolution slider among other interesting things. 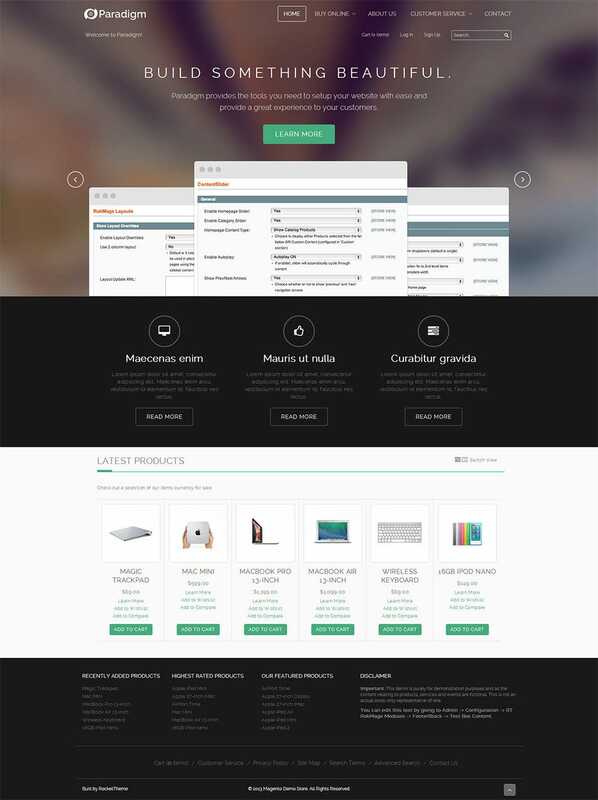 This is a responsive theme with a powerful admin controlled panel. It can be completely customized. The main features of the theme include drop down cart for shopping placed in the header, Megamenus along with sticky menus and off canvas menus etc. The theme comes with a powerful module of admin that helps in managing the theme without difficulty. There is a custom slideshow that can be helpful for show casing the products. The theme is well structured and optimized to ensure best results. 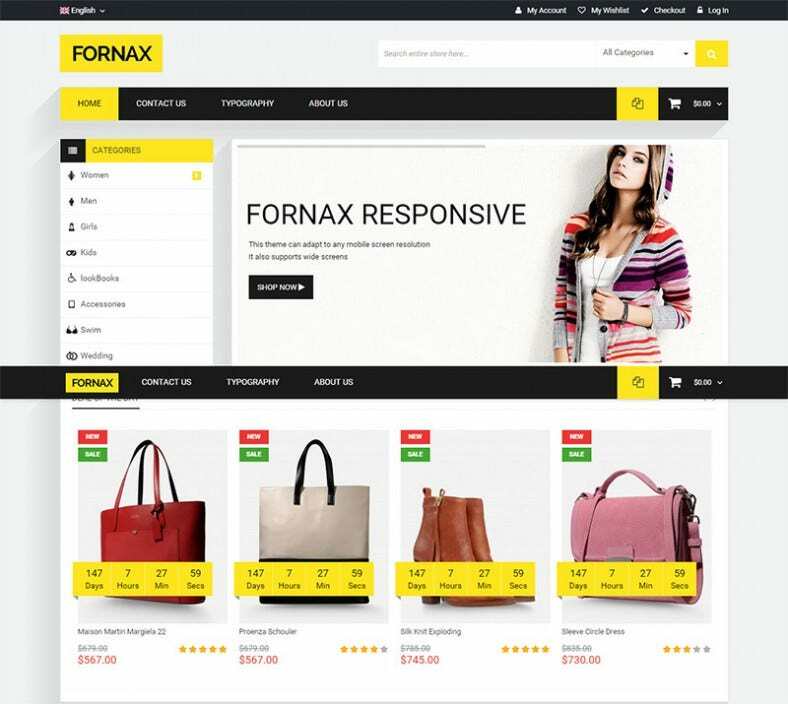 This is a Magento theme enhanced by mobile and responsive in nature made especially for products related to fashion and accessories. There are three preset styles of this template to choose from, with features like Meta tags for social networks. 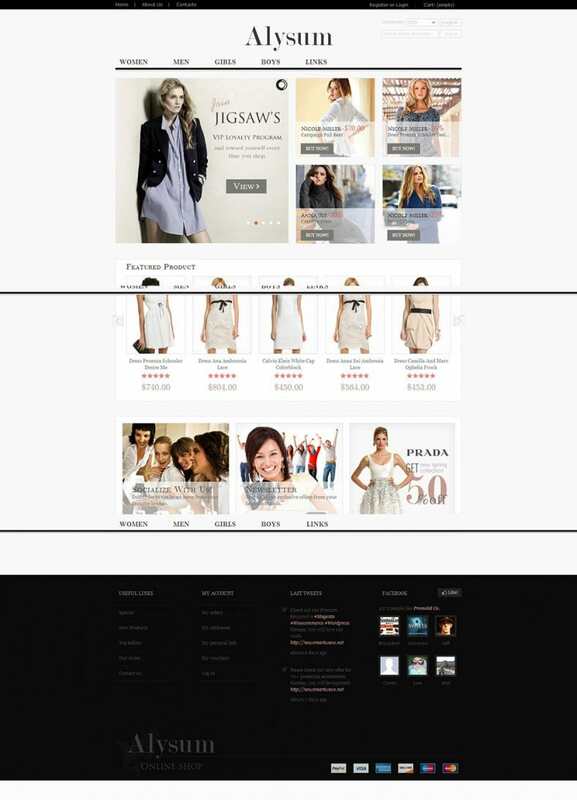 This is a multipurpose and universal 100% responsive Magento theme that comes with the feature of built in blog. There is an admin panel with an option of easy navigation. Moreover, it can be configured according to your choice and needs. This is a theme dedicated to restaurants, coffee shops, chocolates and other such food items. It has a 100% responsive layout, and it is search engine friendly, and therefore, your page will attract a lot of traffic. It has a nice and business like appearance. This theme is made of a contemporary design frame and a transparent and elegant pictures set. The main features of this theme include a fixed header and Megamenus and two side menus in two different sides of the page of this theme. There are different layouts for different themes in this template. It comes with a theme admin panel which is quite powerful. The color and the theme options are unlimited. It also contain more than 500 Google fonts and 206 patterns to select from. The template is built with a contemporary and flat design and contains a number of interesting animations. The approach is like a corporate theme and comes with a number of color background options. It also includes the Megamenu feature in the theme. This is a 100% responsive lay out which is very easily navigable. Though the content is very rich in content yet it has enough white spaces that provide respite to the eyes of the viewer. There are sliders and banners to show case your product. This is a responsive template that comes with bootstrap 3.0. There is also smart slider on the homepage for benefit of the customer. The theme also comes with an Ajax dropdown cart extension. Moreover there is also social login and twitter feed extension. The BeautyShop theme comes with a powerful backend and a stylish design to suit the needs of the customer. There are a number of configuration options which come with admin panel which is easy to navigate. Colors of themes can be managed too. 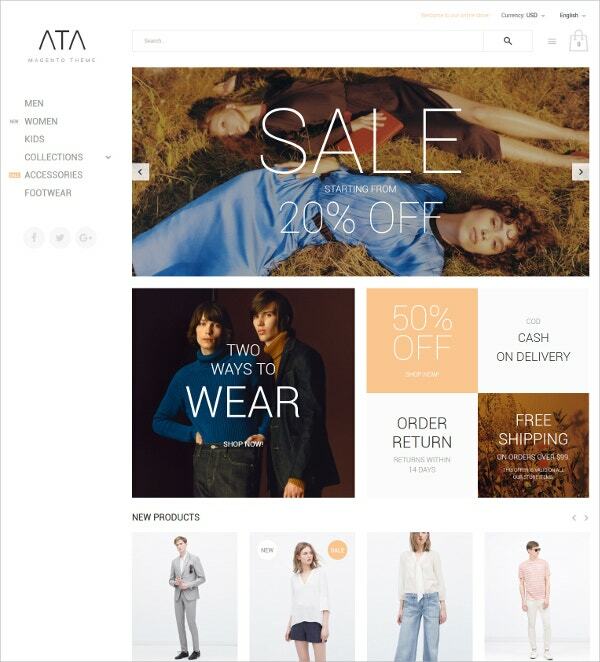 This is a modern eCommerce theme suitable for fashion stores online. The layout is clean and responsive which comes with vertical Megamenu and a slider showcasing featured products. It also features multiple languages which is a useful feature for many. The layout is optimized for faster navigation and is 100% responsive in nature. The main feature of the theme is cloud zoom integration and advanced menu integration among other things. On the product info page there is a custom tab too. It has the MetroUI style design and a powerful backend which makes the design easier to use. There are a number of configuration options which can be used to make the layout more attractive for the viewers. There are a number of pattern backgrounds available. The theme is light and spacious with a clean white background which is elegant and easy to use. This is most suitable for a furniture store. The design is 100% responsive and a vertical navigation. There are two sliders available in the layout for products. The design comes with a modern approach and built in revolution sliders. The main features of the layout is management of theme colors, selection of fonts from more than 500 available options, and more than 200 background patterns which can be used. 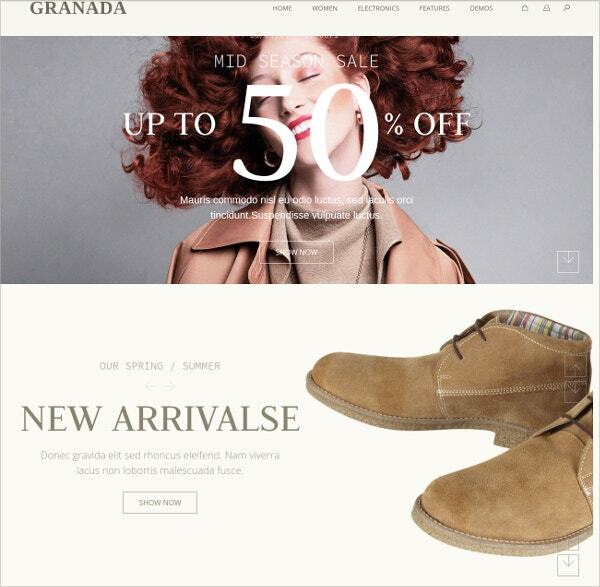 This is a flat and universal layout for eCommerce sites. The features of this include free premium plugins, built in revolution slider among other things. There are also 8 built in themes that can be used other than the configured ones. This template is made for online electronic shop. The theme is minimalistic and the design clean and professional. The background is light blue in color and is quite soothing for the eyes. The functionality is simple and it is easy to install. This is an extremely powerful multipurpose theme which is 100% responsive in nature. It has a modern flat design and comes with a built in blog. Other features of the layout include advanced backend and powerful sliders which are built in. There is a big slideshow, which makes the design more attractive for your customers. It also provides the option of showcasing the newest products in an amazing way. The theme is available in 8 colors, and has extensions like Ajax cart super. If you intend to build your own eCommerce website, the Magento themes which have been listed above will be quite useful. There are a number of features of these themes, which can be beneficial for the customer and thus, the themes can be used by a number of people.